First year this pattern was made was 1916. 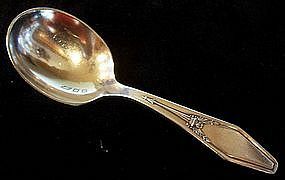 Baby Spoon measures 4 1/8 inches long with 1 1/4 inch-wide bowl.Back reads: 'Holmes & Edwards XIV (encircled)HE (encircled). Shows some wear especially where bowl rests on table. Use USPS link to calculate priority mail postage from zip code 43570 to your zip code. Weight is 12 oz. If other form of shipping is desired, please email with preference.